The Winnipeg Jets extinguished the Wild’s playoff hopes last season, advancing to the second round in just five games before finally getting eliminated in the Western Conference finals by the Vegas Golden Knights. 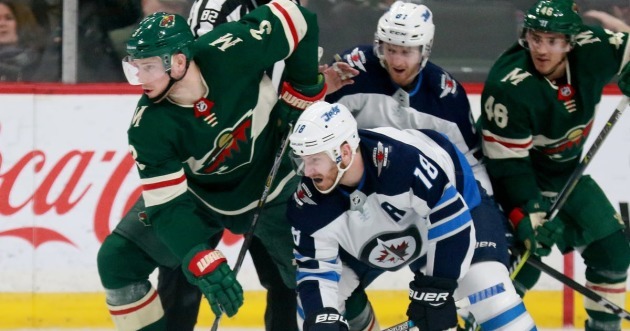 After a run like that, Winnipeg is poised to be a contender this season and the Wild gets its first look in the regular season at its rival Friday when it hosts the Jets at Xcel Energy Center. Although the Jets prevailed last season, it’s the Wild that’s had the upper hand so far this season in the standings. After a 6-4 win over the Senators Wednesday, the Wild ranks second in the division while the Jets are third. Nashville continues to pace the group. Look for the Wild to tighten up after it nearly blew that victory over Ottawa, with the Senators erasing a three-goal hole in the third period before the Wild pushed back with a pair of goals. Before facing Ottawa, the team made a tweak on defense – reuniting two pairings from last season by moving Jared Spurgeon next to Ryan Suter and assigning Matt Dumba alongside Jonas Brodin. And another change could infiltrate the lineup Friday, as the Wild rolled out a few new lines up front during a skate Thursday. Most notably, winger Nino Niederreiter was working on the fourth line alongside center Eric Fehr and winger J.T. Brown. 7: Power-play goals for the Wild in the past five games. 5: Goals for Dumba during a five-game point streak. 3: Assists for winger Mikael Granlund in his last game. 31.7: Percent efficiency for the Jets’ power play. 53: Goals against Winnipeg – the fourth fewest in the NHL. Winnipeg is just two points behind the Wild in the Central Division at 12-6-2. This is the third stop of a four-game road trip for the Jets that started with a 6-3 win over the Canucks before the team fell 6-3 to the Flames Wednesday. Overall, Winnipeg is 4-4 as the visitor this season. Winger Patrik Laine has 13 goals, five of which have come in the last two games. Captain Blake Wheeler paces the group in points with 25.